150-gram double LP pressing by Quality Record Pressings! "I don't know how many copies are left now but I'd pick one up if I were you not only because this the kind of record for which good sound systems are made, but because the moody music, reminiscent of early Impulse!-era Coltrane when Sabbagh dominates and Miles/McLaughlin fusion taken to the top of the highest musical mountain when veteran guitarist Ben Monder has a go at it as he does on "The Cult," flouts majestically, even through difficult, slow moving passages none of which appear to be anchored to chords (and if they are, they are well-hidden!)." — Music = 10/11; Sound = 10/11 — Michael Fremer, AnalogPlanet.com. Read the whole review here. An ensemble that has weathered the obstacles and remained a cohesive unit should be celebrated. Saxophonist/composer Jerome Sabbagh has led his tremendous quartet for 10 years, a rare display of stability in jazz today. Over the years, the band has developed a unique sound, which stems in no small part from the high level of musicianship involved. 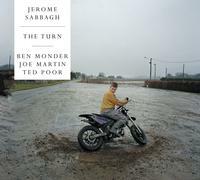 Together with guitarist Ben Monder, bassist Joe Martin and drummer Ted Poor, Sabbagh has recorded his third album as a leader, The Turn — a terrific reminder of the incredible results that can be achieved by a group of dedicated and talented musicians in complete rapport. The Turn was recorded live to analog tape by the acclaimed engineer James Farber (Brad Mehldau, John Scofield and Joshua Redman) and mastered by the legendary Doug Sax (Pink Floyd, Diana Krall, Ray Charles and Sonny Rollins), yielding a sound that is clear, natural and warm, highlighting the band's sonic signature. The compositions on the recording are all originals, except "Once Around the Park," a tune written by the recently deceased master drummer and composer Paul Motian. Sabbagh was one of the last saxophonists hired by Motian and played in the drummer s New Trio alongside Ben Monder at the Village Vanguard in New York in 2011. The band's take on Motian's piece is done in tribute to this extraordinary figure.